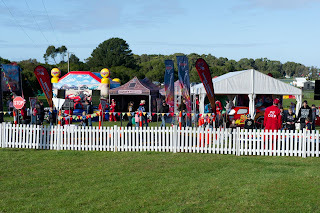 Mummy Hearts Money: Giveaway: Disney-Pixar Fun Zone at the V8's! We are all huge Disney fans in this household. Some of us (me) can recite word for word most Disney Classics and we all count down till we can go visit Disneyworld again one day. Husband loves his V8's wtih a passion too. He's been asking for years now for us to go to Bathurst when the V8's are on and for one reason or another we haven't been able to do it. So what do you get when you marry Disney with V8's? A match made in heaven of course! 2013 sees brand new Disney-Pixar Fun Zone featuring Mack the Transporter at V8 Races all around the country. Following the success of the 2011 and 2012 national Disney-Pixar Cars Truck Tour, the popular family attraction has been supercharged and in addition to Cars now includes three new worlds of entertainment from Toy Story, Finding Nemo and Monsters University. 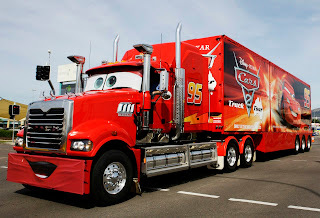 It’s another world first for Australian and New Zealand fans, thanks to the unique initiative between The Walt Disney Company, Australia, Mack Trucks, V8 Supercars and the Entertainment Store, which sees the launch of a brand new travelling attraction called the Disney-Pixar Fun Zone in 2013. Aspiring young cow-girls and boys will love the colourful Toy Story themed attraction within the Disney-Pixar Fun Zone, as they test their roust-about skills in Woody and Jessie’s Lasso Challenge. They’ll also get creative in Woody’s workshop, and build their own bandit moustache and sheriff badge to take home with them! 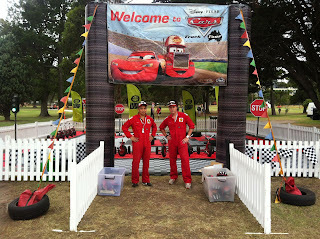 You won’t want to miss the Disney-Pixar Fun Zone in 2013. Get lost in the Monsters University maze; bounce and slide on the awesome new Cars-themed two-track giant inflatable slide; or just chill-out in the Finding Nemo 3D Movie Dome. The Disney-Pixar Fun Zone will be appearing at V8 race days all around the country. See here for more information about dates and locations. Tickets to the V8's can be purchased at Ticketek. As a plus for budget conscious families, the Disney-Pixar Fun Zone activities are included in the entry price for the V8’s! Kids under 12 are free to enter, making it possible to take the whole family along for a great day out. Now for the best part – I have a Family pass to the V8 Supercars Sucrogen Townsville 400 to giveaway to one lucky reader. The Townsville dates are Fri 5 or Sun 6 July. For your chance to win, entry via the rafflecopter below. And and don't forget to tell me who your favourite Disney character is! My husband would LOVE this prize! Oh and my favourite Disney character would be Mater! Im a Dead Ringer for Captain John Sparrow so he is my favorite. My favourite disney character is Turk from Tarzan. I have just dug the movie out again for DS and I love her witty quips. I love Sully from Monsters Inc as he's a bit like my husband, big scary but soft and sweet on the inside! My favourite Disney character is Bambi, how adorable.. As a child I always thought Bambi was a girl, was a tad disappointed when I realised he was a boy. But absolutely love the little deer and was thrilled to find Bambi Pj's at Target yesterday! -- But my boys LOVE Cars so think this is a pretty awesome comp as does Hubby who says his favourite character is Mickey. It is very generous of you for taking the time to discuss this, I feel strongly about it and will love to learning more on this at future. If possible, as you gain expertise, would you mind updating your blog more often with more useful information? Honestly It is extremely helpful for me.